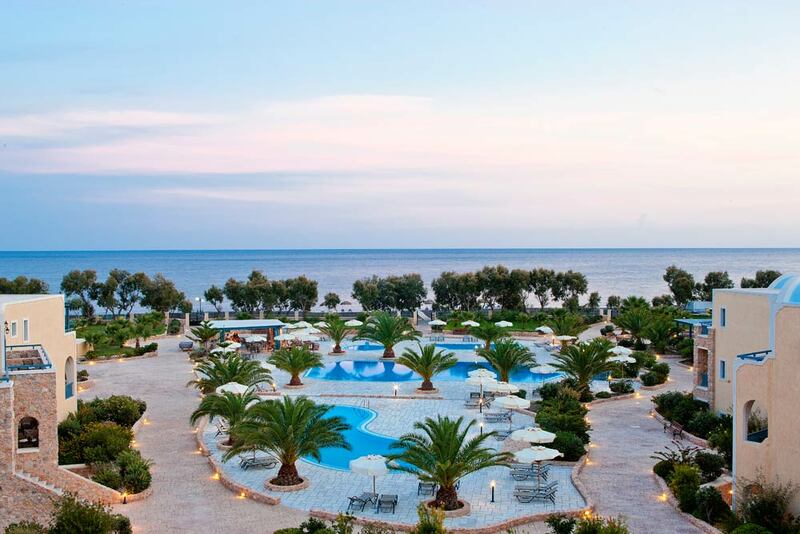 The Santo Miramare Resort is situated on the southeast side of Santorini in Perivolos, facing the promenade and the famous 3km coast line, well renowned for its black sandy beaches. Built between 2003-2004 this complex consists of 85 elegantly appointed rooms combining traditional and unique contemporary architecture blended with modern day amenities and exceptionally high standard of service. The hotel has a very large pool area and private beach (close to the water sports) where the sun beds & umbrellas of the hotel are free giving guests the choice of the pool or beachfront settings whilst in the evenings strolling along the waterfront they will find restaurants, traditional fish tavernas, bars or clubs with great music. 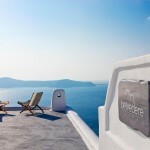 The hotel’s restaurant serves evening meals where you can sit inside or out and enjoy the delicious buffet which comprises in Greek-Mediterranean gastronomy, with scenery of the pool and garden area. Hotel facilities: 24 hour reception, daily maid service, American buffet breakfast served at the restaurant, laundry service, internet access, wake up service, fax service, babysitting/child services, conference room up to 100 people, meeting room up to 20 pax, satellite TV lounge, garden, outdoor Jacuzzi, 2 open air main swimming pools, pool beds/umbrellas, children’s pool, poolside bar, snack bar, fitness centre, sauna, restaurant, parking and private beach with sun beds & umbrellas for hotel’s guests only. Room facilities: All room types have air conditioning, fridge/mini bar, direct dial telephone, satellite TV, radio, safe box, hairdryer, internet access, marble bathroom with bathtub or shower, private balcony or terrace with sea, pool or garden views. Studios and Family rooms feature a fully equipped kitchenette, too.